I can has a clever uncle? smart uncle, originally uploaded by Tim. 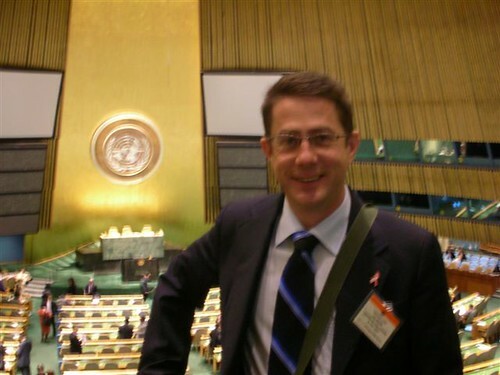 This is my uncle just before (or after, I’m not sure) he gave his speech to the UN General Assembly. Pretty cool huh? Australia’s venerable A Current Affair, in another one of their so called pieces of “journalism” may have caused another car accident involving a truck in the Domain tunnel where 3 people died in a car and truck pile-up in March. The Age is reporting that the team of geniuses from ACA drove through the tunnel with a camera crew in a car driven by another genius who is scared of trucks. An icy pole is distracting enough, let alone a camera crew! A witness said that they sat in the right hand lane for the entire length of the tunnel unable to maintain a constant speed, in front of a 22 tonne truck! The truck was forced to change lanes, allegedly resulting in an accident with another vehicle. How stupid are these guys? There’s nothing that annoys me more than idiots who sit in the right hand lane! So don’t do that, move to the left, you don’t own the road. Now when you combine that with moronic current affairs shows that try to pass themselves of as journalism, you’ve got a corker. Here’s my advice, don’t watch anything on commercial TV at 6.30pm. Better yet, don’t watch commercial TV. Full stop. If you have the time, money or inclination (you don’t need much of either) and you occasionally feel like you want to do something that might make a tiny difference, you should do one of these things. None of these things require much time money or effort and you’ll feel better for having done it (if not a little light headed). If the Howard government is going to be too stingy to commit to decent foreign aid targets, you’ll have to do it yourself. Dont listen to people who winge about not knowing where the money goes. Every charity has administration costs. That’s a fact of life. Merely ask them who they’ve tried to help recently. You might want to try a few different organisations that have programs and philosphies that you’re comfortable with. Once that money starts disappearing every month, you wont miss it. Join Amnesty International or any other group that promotes human rights. For about $30 -$50 a year (its cheaper if your a student) you can become a member. You’ll get kept up to date with campaigns and can be as involved as much or as little as you like. You might just want to sign a few petitions and send a few emails, or alternatively join one of the action groups. Only 3% of people in Australia do it and the supplies are always low. I takes a couple of hours 4 times a year. Pretty much anyone can do it, you don’t have to be in perfect health. And it doesn’t hurt. Much. This one is probably the hardest, mainly because it requires the most effort on your behalf. The best way to go about it is to have a look at your own skills and find somewhere you can be useful. If you’re a lawyer volunteer at a Community Legal Centre. If you’re an accountant see if you can do the books for a local community group or charity. Whatever you’re good at, do that. Time is like money, once that few hours a week disappears, you wont miss it. Too much. Don’t need to compensate for anything? If you live in Australia and don’t feel the need to drive a car with an engine that compensates for deficiencies in other areas then this site may be for you. OzHotHatches is a new forum for those of us who drive cars that can actually make it round a corner and don’t burn hundreds of litres of fuel in the process. You can discuss new models, get tuning tips and have a look at what other people are driving. Most of the discussion seems to be around Euro models which get a bit neglected in Aus. 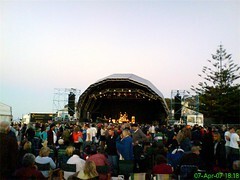 The inaugural Point Nepean Music festival was held down at the old quarantine station on the Mornington Peninsula. Just thought that this photo captured the great atmosphere there. You should also check out Ben’s blog which revolves around his trip to Europe and associated musings. Its the associated musings that I’m concerned with here. There’s some really interesting posts re religion and atheism which I might cover later.